Since I can't post the Christmas presents that I have been working so hard on I will post a few little things that I have been working on that aren't a secret. First, here are some little ornaments that I knitted for my sister's tree. She wants to decorate her first tree in her new home with handmade ornaments so that it will be special. Unfortunately, due to stupid family drama, she won't be able to use any of our family ornaments. I decided to make some ornaments that will be special and represent her first Christmas with her husband. 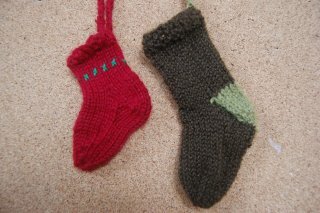 I made these with scraps of yarn and ribbons. 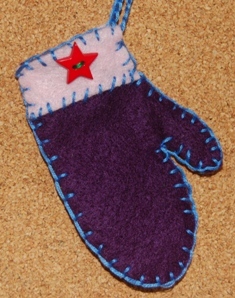 Then I decided to use some scrap craft felt to make a few sewn ornaments. These were super fast to put together and came out really cute. Now I really BADLY want those ornaments. They will look great on our tree. Even though I haven't seen them in person they are making me want to cry. Thank you sooooo much.